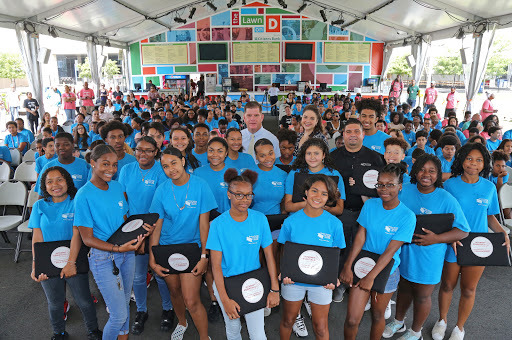 BOSTON - Tuesday, March 26, 2019 - Mayor Martin J. Walsh today announced the return of Boston Centers for Youth & Families (BCYF) summer SuperTeens Program. Youth ages 13-14 in the SuperTeens program will have the opportunity to attend weekly leadership development workshops, gain work experience in BCYF community centers and participate in field trips to Boston's arts and cultural institutions. Registration begins on April 5. "I am excited that this summer we are able to expand the program to give 275 teens real work experience that will prepare them for future education and allow them to gain more opportunities," said Mayor Walsh. "The SuperTeens Program will empower our young people with important life skills, and I'm proud we're able to bring this program to so many teens." Sponsored by Comcast and The Foundation for BCYF, this program will provide hands-on work experience and/or service experience, engaging youth in high-quality leadership development workshops based on BCYF's Youth Development Outcomes. Learning based field trips will aid in the development of life readiness and resiliency to help prepare them for their upcoming academic year and future employment. "This program is very fun and I had many opportunities to meet new people and to learn new skills that I may need in my future." said Avriel Heraldo, age 13, of Dorchester. "This was fun for my first job and I feel like it prepared me for when I get a real job when I'm older." The SuperTeens program will run six weeks beginning on Monday, July 8 and ending on Friday, August 16. Participants must be at least thirteen years old on or before July 8 to participate and will receive a stipend at the end of the summer for successful completion of the program. All SuperTeens applicants must complete an online application on BCYF's website at Boston.Gov/BCYF. Online registration will open on Friday, April 5. All slots will be filled on a first come, first served basis. Slots are guaranteed for 275 youth.